The museum’s building was erected in 1906, as a house for the Ottoman Governor. It was part of a group of government edifices, including the Seraya (which housed the central administration), which is now on the grounds of a military base, and the Great Mosque, which these days serves as the Museum of Islamic and Near Eastern Cultures. These buildings were positioned on the main road leading from Gaza to the center of the town. The Governor’s Mansion, called khonak in Arabic, is typical of the Ottoman style throughout the empire: a magnificent residence of a wealthy family, usually intended for the governor or some other dignitary, where formal meetings and receptions would occasionally take place. In the early years, the ground floor was used for receiving the public, while the upper floor, reachable by an exterior flight of stairs, served as the family quarters. The façade features a colonnade of four pointed arches, flanked by rounded ones and topped by a balcony at the center of the second floor. 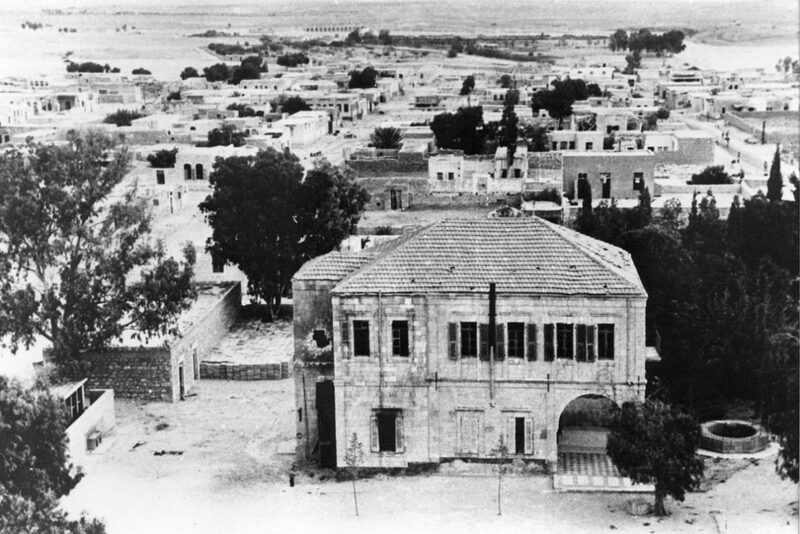 During the First World War, British and Australian battalions conquered Be’er Sheva, and the mansion became the residence of the top British officer. In later years it had been converted into a school for local Bedouin girls. Eventually, the building acquired interior stairs, as well as a toilet on the ground floor and two bedrooms on the upper. In 1948, the town was conquered by the Israeli army following battles with the Egyptians, who had occupied it after the British departed. The building was then used by the Israeli Defense Forces (IDF). In 1950, the modern city of Be’er Sheva was founded, and the building was used as its first City Hall. 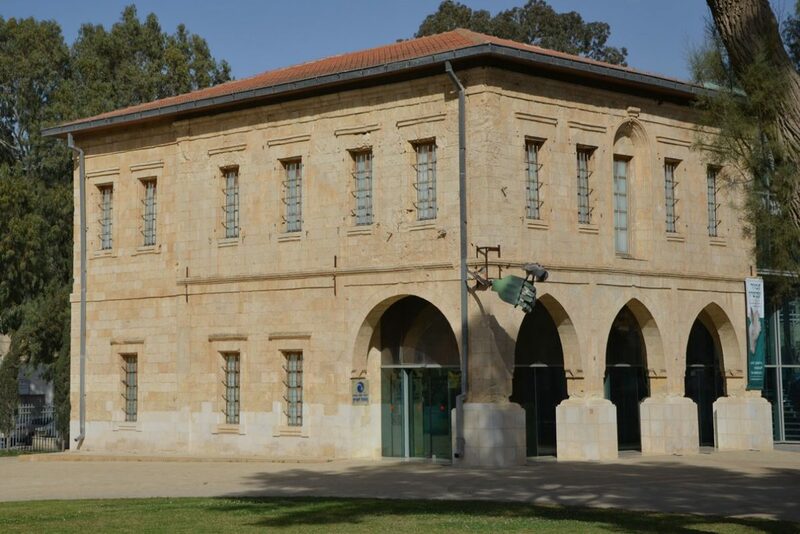 In 1972 the municipal administration moved to its current home, and the Governor's Mansion became the art wing of the Negev museum. In 1948, the town was conquered by the Israeli army following battles with the Egyptians, who had occupied it after the British departed. The building was then used by the Israeli Defense Forces (IDF). in 1950, the modern city of Be’er Sheva was founded, and the building was used as its first City Hall. In 1972 the municipal administration moved to its current home, and the Governor's Mansion became the art wing of the Negev museum. In 1998, the building was declared unsafe and was closed to the public. Between 2000 and 2004 the building underwent restoration, planned by architect Ze'ev Gur and executed by the Conservation Department of Israel's Antiquities Authority. The guiding principle of the restoration program had been to preserve the structure's original character while making some changes so as to comply with modern building regulations. In order to enlarge the space, the original entrance was enclosed by glass walls, creating a new lobby. This has been done without affecting the building's exterior aspect, as required by preservation regulations for old buildings. The second floor entrance has been designed to preserve the exterior passage between the floors, and the current upper entrance occupies the same opening used by the family of the Ottoman Governor. The design approach chosen for the modern addition was to use contemporary materials such as glass and metal, which are very different from the original building materials, thus clearly distinguishing between the original and the new parts. Furthermore, changes were made to the interior, adapting it to the requirements of an art museum. The Negev Museum was re-opened in 2004, and since then it has presented a continual series of changing exhibitions, as well as displays from the permanent collection. In 2011, the Governor's Mansion was proposed as a candidate for the title "one of the seven wonders of Israel." The Negev Museum opened in the early 1950s, in the Great Mosque It was then an archeology museum. Zvi Ofer was its first director. Siona Tagger and , Zygmunt Schretter were among the first artists to be exhibited, represented mostly by landscapes and depictions of the new Jewish settlement in the Negev. The museum has initiated and presented exhibitions of Be’er Sheva artists, and some of the works were included in the museum's collection. By the 1960s, the museum was holding collections of paintings, reproductions, and etchings by well-known artist from Israel and other countries, as well as photographs and color slides of the Negev. One of the museum's initiatives has been to persuade the municipality to waive city taxation of artists' studios, thus encouraging artistic activity in the city. The right-hand wing of the mosque building was used for changing exhibitions of contemporaneous artists, such as Benjamin Buchbiender (sculpture and drawings), Esther Burstein (sand paintings), David Ben Shaul (lithographs), Raffi Lavie (paintings), and Pinhas Eshet (sculpture). The Museum's Friends' Society was founded in the mid-1960s, to help with the acquisition of art objects and with research activities. Raphael Lohat directed the museum in the early 1960s, followed by Yael Israeli through 1967. The museum's art consultant, the artist Hava Mehutan, was the director until 1984. The exhibition of Marcel Janco in 1968 was among the important exhibitions mounted during her time. Under the direction of Noa Tal, the museum has started to operate as an independent art museum with changing exhibitions. The first exhibition not drawn from the museum's collection was " Eliot Fay – Photography, Joseph Ratz – Graphics" (1989). Tal had slowly developed relationships with international artists, and curated a large exhibition that year – "Diptych: Aspects of Abstract and Figurative Art in 1980s Italy" (1989). With Noa Tal's guidance, the museum organized annual Autumn Exhibition for members of the Association of Painters and Sculptors. Some of the participants in these shows donated works, thus expanding the collection of the Negev Museum of Art. In 1990, with the closure of the Archeological Museum, Galia Gavish became the Negev Museum's director, and she continued to develop the exhibition program. She established the Ceramics Biennale (1993), in the museum itself and all around the city, in cooperation with the Harsa ceramics company. Participants included ceramics artists from Israel and from around the world. Gavish worked to expand the collection, acquiring artworks with the support of the Israeli Art acquisition Project, the Ministry of Education and Culture, and the Public Council for Art and Culture. Reisman. In honor of the 60th anniversary of the State of Israel and of modern Be’er Sheva, and the 90th anniversary of the town's conquest by ANZAC forces, Raved has curated "60-90-60" (2008), an exhibition of historical photographs of Be’er Sheva's past. She also continued to expand the network of connections with other institutions through her cooperation with the Israel Museum, Jerusalem, and brought in an exhibition of documents and portraits from the Vera and Arturo Schwartz collection of Dada and Surrealist art, titled "Portraits" (2009). During her tenure, Raved provided a platform for many local artists, among them Yocheved Marks, Yehudit Meir, Chaim Meir Weiss, Moshe Schek, Daphna Nissim, and Stella Zack, and continued to expand the collection through acquisitions, as well as donations of works by artists such as Michael Gross and Moshe Mokadi. Since 2011, the Negev Art Museum of Art has been managed by Kivunim – the Municipal Company in Be’er Sheva - with the appointment of Dr. Dalia Manor, art historian and curator, scholar, and lecturer specializing in Israeli art, to the role of director and curator. Her exhibition program focuses on bringing the work of Israel's best artists to the Negev, among them Menashe Kadishman, Sigalit Landau, Micha Bar-Am, Danny Karavan, Ludwig Bloom, Marcel Janco, Pavel Wolberg, Etti Abergel, Dalia Amotz, Hanna Sahar, Oswaldo Romberg, Anna Ticho, and Noam Rabinovich. Another emphasis is the importance and position of the Negev in Israeli art, and the exhibition of regional artists, such as Jasser Abu Rabi'a, Eyal Assulin, and Dov Heller. The museum highlights selected chapters from the history of art in Israel through group exhibitions. In recent years, it has hosted several important international exhibitions, among them the last show of the Italian artist Jannis Kounellis, and an exhibition of contemporary Australian art. 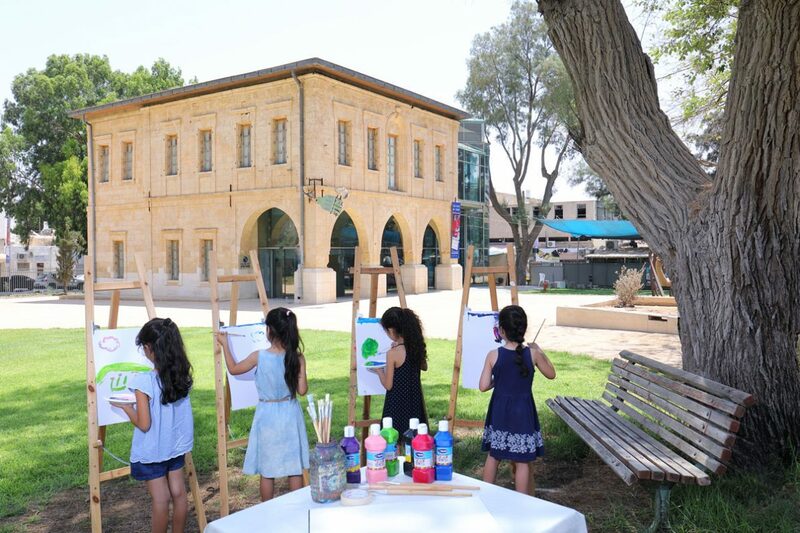 The museum offers educational programs for children and adults, as well as creative workshops for all ages during holidays and the summer vacation. 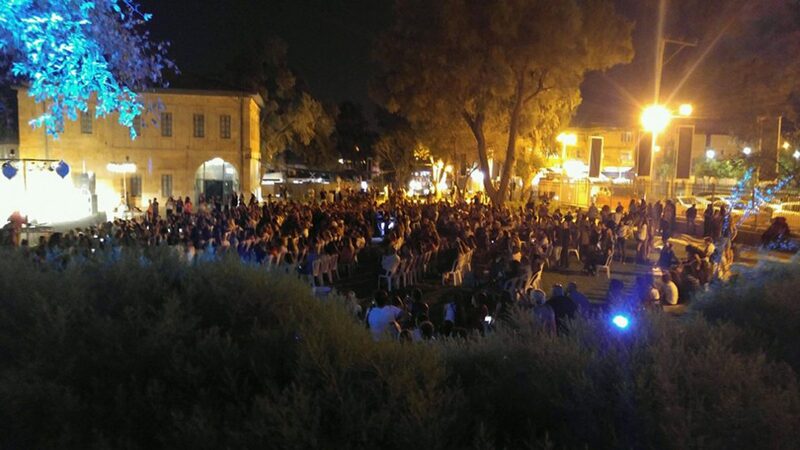 During the summer, the museum hosts municipal events and music concerts on its lawn, in particular the “Mondays at the Museum” program.